It was normal yesterday today i was hmm surprised by the red text saying you need lvl 40 when im lvl 73 witch you will see from image.Pls fix it this can confuse ppl and cause them to miss their attempts cuz of the text.But in the end i still click it and did my attempts but for some ppl if they dont click it and belive on the text can cause them some missing attempts . 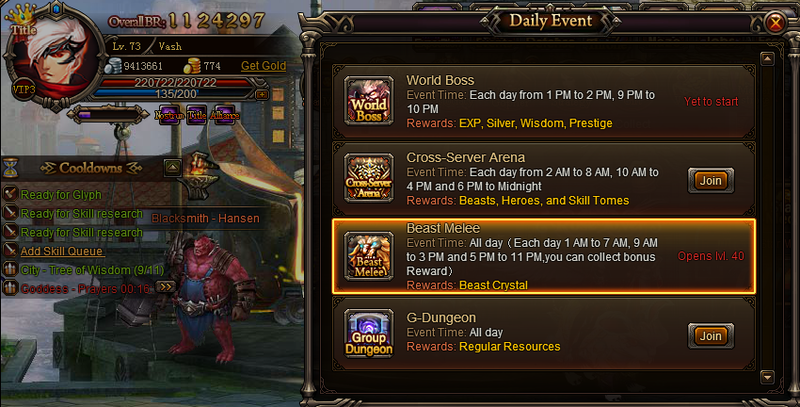 As per announcement, Beast melee won\'t be accessible for 2 days from April 28 to April 29. Point taken i totally forget about it ^_^. 2019-4-22 09:00 GMT+8 , Processed in 0.052870 second(s), 38 queries .